Free Shipping Included! Inateck iPad Keyboard Case for 9.7'' iPad 2018(Gen 6)/iPad 2017(Gen 5) and iPad Air 1 with intelligent magnetic switch,Dark Grey by Inateck at Pacs BG. MPN: BK2003NEW1-DG. Hurry! Limited time offer. Offer valid only while supplies last. 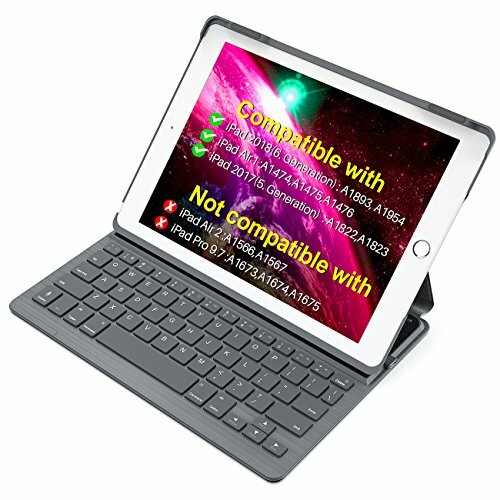 The intelligent magnetic switch design allows the keyboard power on once you lock the iPad in upright position, and it will instantly power off when you separate them. Comfortable workspace and suitable angle can greatly improves your typing experience and provides you versatile viewing angle for entertaining. Package Contents: Inateck wireless Bluetooth Keyboard Case, USB charging cable, User manual.